This is what happens when a duck gets confused as to whether it's Spanish or French. Or Asian, even. So what do we call this dish? 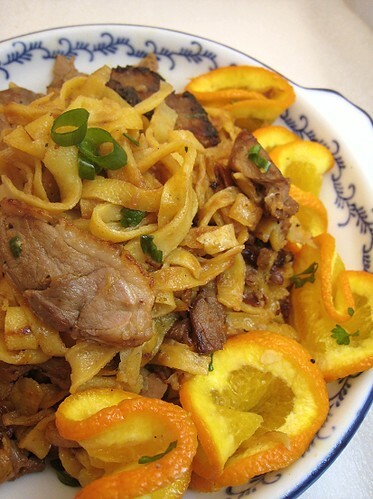 Orange Duck & Crêpe-Noodle Stir-fry? 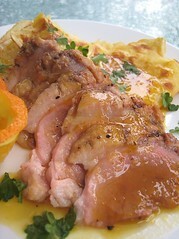 Or the more utilitarian Roast Duck and Orange Crêpes with Orange-White Wine Sauce? But, we're getting ahead of ourselves. 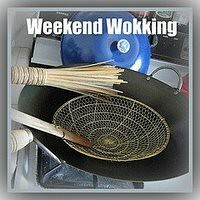 We almost did not get to create something for this edition of Weekend Wokking, with the month-long illness and all. But, we realized that we were the hosts this time around! How embarrassing if we did not make a dish to enter. Idly searching for information about influenza and home remedies for said illness, I came across an Ayurvedic site telling me that one of the causes of influenza is our "faulty lifestyle." The ingredient this time is the orange. Thinking of oranges made me think of Spanish food. 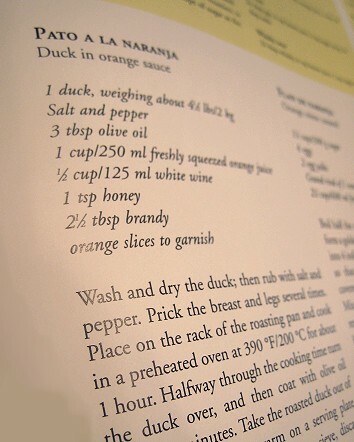 I thumbed through our Culinaria book and on the "citrus fruits" section saw a recipe for Pato a la Naranja. That's Duck with Orange Sauce to us English-speaking folks. After some heeing and hawing, we finally decided on going ahead with that, realizing that we actually had a frozen utility "may-have-parts-missing" duck that we could thaw out. Of course, being us, we couldn't just have a roast duck with orange sauce. Nuh-uh. But more about that later. We more or less followed the recipe as is. So, first up, roasting the duck. I washed and dried the duck, and rubbed it with salt and pepper. I scored the skin, placed it on rack in a roasting pan, and roasted it in a 400F to 450F oven for about an hour, starting breast-side down and turning it over about halfway through the cooking. I was too lazy to baste with olive oil, though. So, when I turned the duck over, I placed some duck fat that I've removed from the thigh-ish area of the bird on top of the breasts. In the meantime, I had to get starting on the orange sauce. 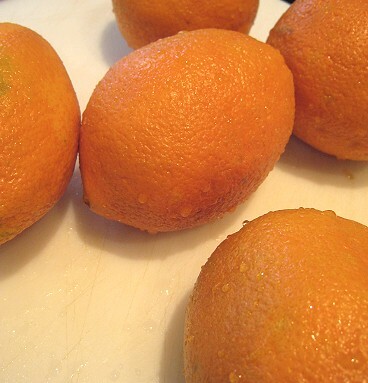 I zested about 4 oranges (I don't remember now) and set the zest aside. I needed about a cup of juice, but these oranges were so juicy. I ended up with about one-and-a-half cups. I let the mixture reduce, then added honey and cognac. 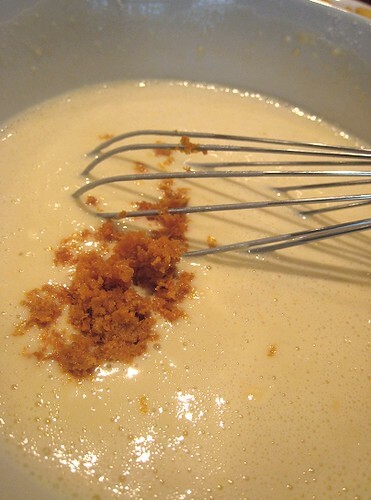 I only added about 1 tablespoon's worth of cognac, and about 2 tablespoons of honey. I adjusted it to taste. A little salt and pepper and the sauce was done. I didn't realize that the half-cup of white wine would make it so wine-y. 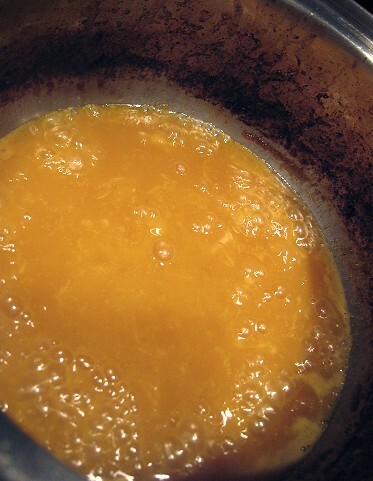 Hence, I'm calling this Orange-White Wine Sauce. And here's the finished roast duck. 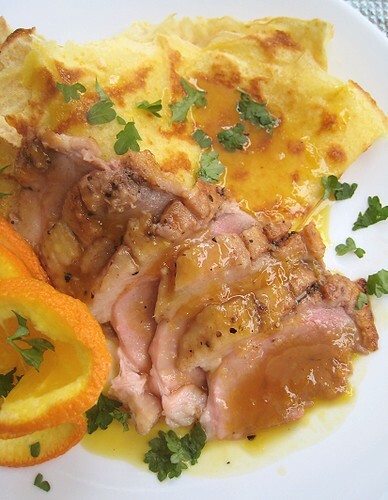 When we were throwing ideas out in our "salon," after duck with oranges, the other dish that we immediately thought of was crêpes Suzette. 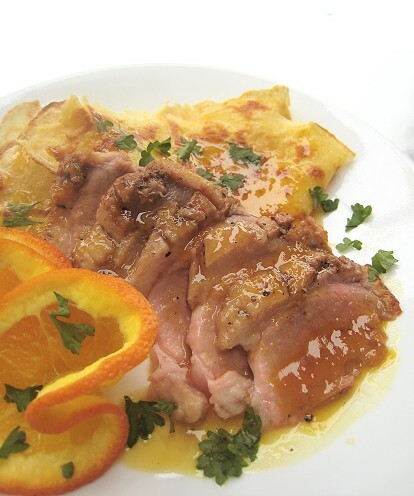 So, of course, the next logical thought was, "Why not do the duck with orange sauce and then put shredded duck meat inside the crêpes and "Suzette" them? We can flambé tableside even!" Well, maybe the flambéing is a tad ambitious. But you see where we're going with this. 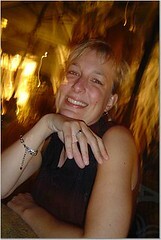 Our little trip to Spain was taking a decidedly eastern route to France. For the orange crêpes, we simply used a standard crêpe recipe and added a whackload of orange zest (reserved from zesting the oranges I juiced). So that's 2 eggs, 1 cup all-purpose flour, 1 cup milk, 3 tablespoons butter, melted, a pinch of salt, and some water to adjust the consistency of the batter, all mixed together and rested in the fridge for about 15 minutes. Then it was batch-cookery time for me. 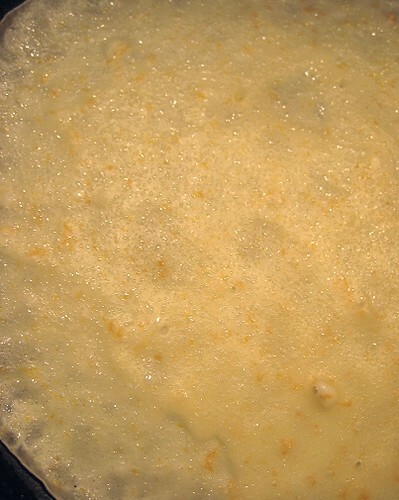 Here is a crêpe finishing its cooking on one side. 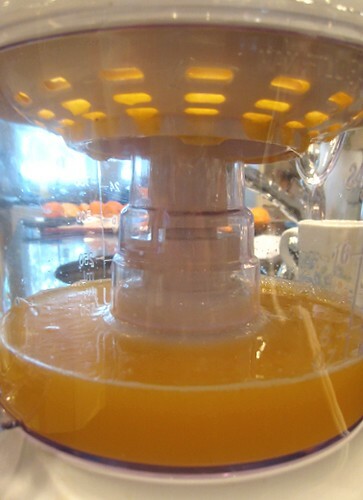 See the zillions of orange zest in there? I decided to plate this two different ways. 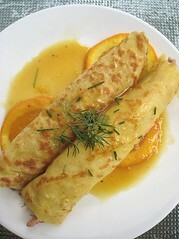 Above are some folded orange crêpes, a sliced duck breast, and spoonfuls of the orange-white wine sauce. Plate #2 is JS' plating idea. 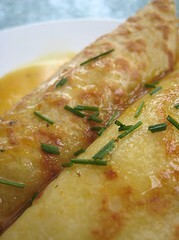 I shredded the dark meat and used that as the filling for these cigar-shaped crêpes. Once again, spoonfuls of the orange-white wine sauce finished it. To compensate for our "faulty lifestyle," TS and I were given antibiotics (as we had apparently gotten a bacterial infection after being sick for so long with a viral infection.) "Finally", to the relief of Mama, who kept pushing for antibiotics. With the antibiotics came the warning not to have any sort of dairy while taking. We weren't sure if the dairy prohibition extended to dairy incorporated into a particular item, for example, the crêpes, but just to be on the safe side, we refrained from having the crêpes. I tasted the duck with the sauce and it was quite good. Better than I expected because I was afraid that I was not going to like the orange sauce on account of its sweetness. I did find the sauce to be on the sweet side and would like an infusion of something savoury in the sauce. It must be the Chinese in me, but I actually like my duck longer-cooked than medium or medium rare. 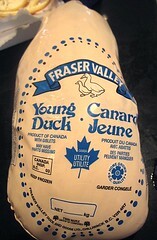 I find more of the ducky aroma and flavour coming out the longer the meat has been exposed to the heat. I also tasted the duck with the sauce and found it to be quite good. But I had the feeling I was missing something. So, I walked on the wild side and had a tiny, tiny, tiny piece or crêpe (as in, the size of a grain of rice, it seemed). 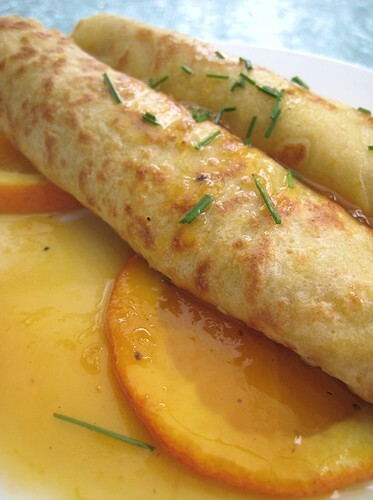 The crêpes were really good with their orange fragrance! But, I think I still lacked the full impact of the dish at this point, being crêpe-less. Because we couldn't really have the crêpes, we left the two plated dishes, the shredded duck, the orange sauce, and the rest of crêpes on the counter for people to see and eat. We figure our family can just assemble their own crêpes when they were ready to eat, following the example of the two plated dishes. That night, before going to bed, we saw that the plates were left untouched! Nobody ate anything. We saran-wrapped the plates up and shoved them into the fridge, scratching our heads. 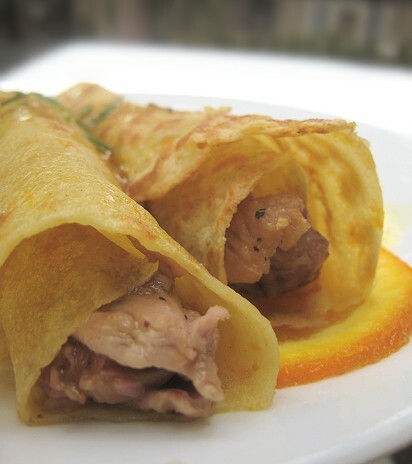 While preparing dinner (Hainan chicken) the next night, we figure we'd do something about these "Duck Crêpes Suzette". Maybe, the plates were just too fancy for our tastes and we don't swing the fancy-schmancy way, I speculated. We somehow had to change how the whole thing looked. The crêpes have transformed into noodles! Well, they're more like fettuccine. 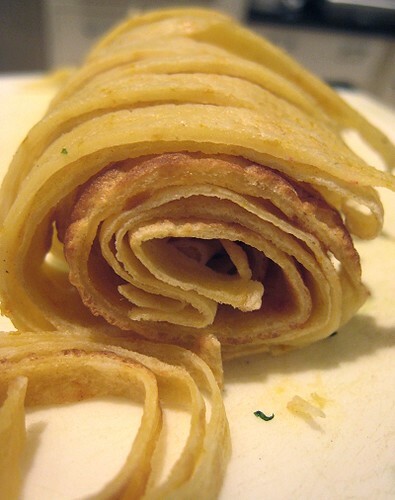 To make them, I simply stacked the crêpes, rolled them, and sliced away. How did this genius idea (if I do say so myself) come about? When JS and I were wondering what to do with the duck and orange sauce, we figured that we should just sauté the duck with the orange sauce for ease of eating, as well as to cook the rare-ish breasts a tad more for the rest of the family. Having decided that, I wondered, should I also put the crêpes in the pan as well? "Why not," we thought. Of course, whole crêpes in the stir-fry would be quite unwieldy. Hence, "noodles"! 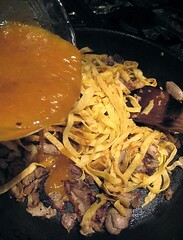 It was simply a matter of adding the sliced and shredded duck into a hot pan, adding the crêpe-noodles, and finishing with the orange-white wine sauce. After the make-over, we put the plate on the table, besides the Hainan chicken (with ginger-scallion sauce) and some pork chops. My dad still got a tad confused because of all the food (he claims that he cannot deal with a lot of food because he doesn't know what to eat), but the duck crêpe noodle dish had some takers and ended up getting mostly finished. We still couldn't have any of the crêpes that day. The next day, however, we were free from the dairy-free tyranny! 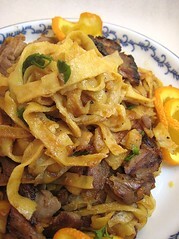 I saw the very, very small amount of this Orange Duck Noodle dish leftover from the night before and tried it. Oh my! Delicious! The crêpe noodles were so buttery and fragrant and the orange-white wine sauce wasn't as wine-y, and it had completely infused the noodles and duck with its flavor. Very nice indeed. Our Spanish French Chinese confused and confusing duck, done. (Galician-style Meat Pie with Turkey Filling), plus Turkey Cracklings! The host this month is us, TS and JS of [eatingclub] vancouver. There's still time to submit entries! We will be accepting entries until February 2. Email us your entry at email [at] eatingclubvancouver [dot] com. 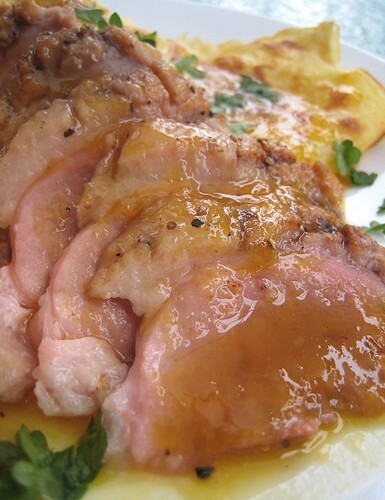 I love the crepe noodles... and all the incarnations of your roast duck! And if you want, I can have a talk with Dad.... if it looks this good, he should eat it! They all look really delicious to me esp the "noodles"!! I have and love that book. Its very creative and stunning how you transformed the crepes and duck into the Wok Dish. Very nice. that looks AMAZING! I love crepes, love duck, love orange. I see a long day in the kitchen with a very happy ending in my near future! A confused duck is obviously a good duck! I love your creativity! Amazing dishes. 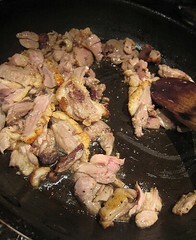 I love the way you can create so many dishes with just one duck, and one sauce! Love the plating, too! I am so impressed. I have wanted to make both duck and savory crepes. What a nice combo...stunning! A fabulous post from start to finish. Crispy skinned duck, wonderful sauce, love the crepe noodles and the duck meat crepes. 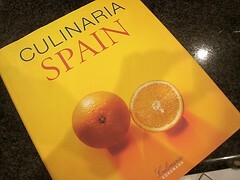 You've also got me wanting that Culinaria Spain book...would look good right beside Culinaria Greece. What a delicious meal! Everything looks wonderful! Great post and recipes. Both meals look so delicious. 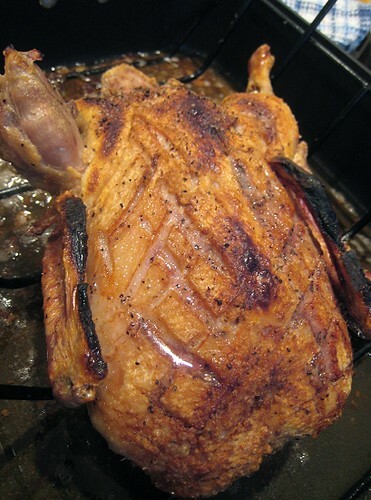 The skin on your duck looks amazingly crispy! So delicious. I'll take one of each version please. And a second helping too? Thanks for hosting! At least you had the excuse of being sick, I've just been lazy and late to submitting for my own event! I'll take all 3 plates, they all look so delicious! 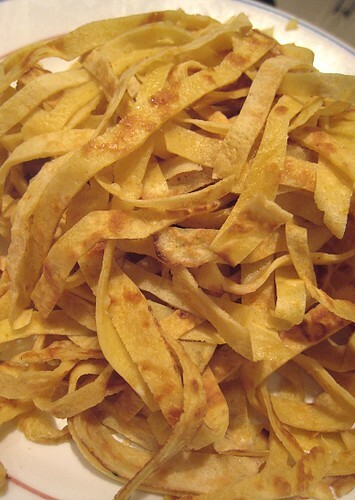 Great idea about turning crepes into noodles. another brilliant idea from you :) hehehe. well done! You people need your own cooking show, this was dang amazing! Absolutely brilliant! I love the crepe noodles. Glad to hear you have recovered from your "faulty lifestyle". This sounds like a great meal! I have been wanting to try cooking duck for a while! It's my fanatasy that all food bloggers live in one neighborhood... And everybody gets to eat at everybody's. =D Lahat ay BWISITOR. Teehee. Those crepe noodles were good! Makes me want more now. We do have Culinaria Greece too! You just reminded us to start flipping through that again. We were afraid you really weren't going to submit anything! Yeah! We didn't have the regulars submit entries. [sniffle] And man, I've been seeing all that DROOLWORTHY food in Jakarta... maybe you have to take us there! I do believe that orange juice smoothie would have been eligible! That's such a wonderful idea. I'd love to try crepe noodles. And duck is always a good thing, yum! Oh yeah! I didn't think of that! Although, I don't know if entries are supposed to be "exclusively" for the event.